The Southwestern String Quartet, under the direction of Marc Elysee, played for the Convocation. 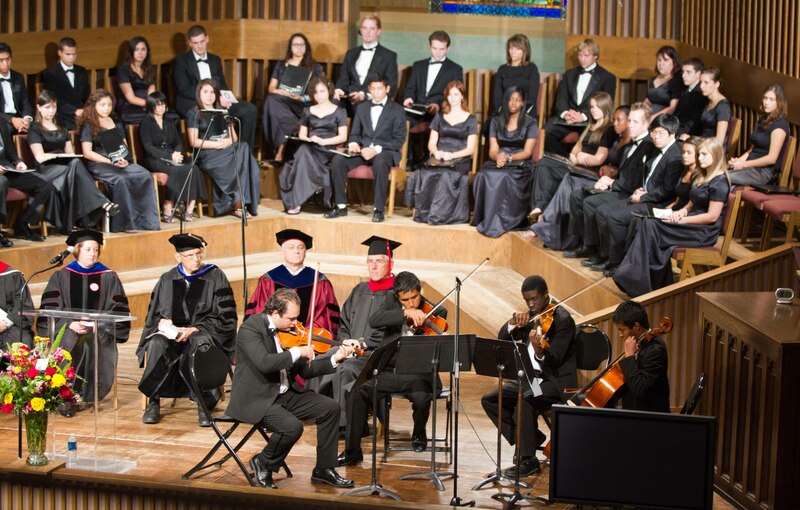 The Southwestern Brass Ensemble played, the professors and administrators entered in traditional robes, and Southwestern Adventist University’s annual Convocation Service marked the official beginning of another school year. Students, faculty and staff met for the occasion Friday evening, Aug. 24 in the Keene Seventh-day Adventist Church. Amy Rosenthal, Southwestern’s new vice president for academic administration welcomed students and the rest of the audience to another school year, stating that the pageant associated with Convocation draws from an academic tradition that goes back to Middle Age Europe. Speaker for the annual event was Jon Dybdahl, Old Testament scholar, former missionary and former president of Walla Walla College, who was introduced by University President Eric Anderson. Dybdahl asked the audience the question: “Are You a Seventh-day Deist?” He challenged students to allow God to work in their lives on a daily basis. Dybdahl is the author of Hunger: Satisfying the Longing of Your Soul, published in 2008. Music for the Convocation was provided by the Southwestern Brass Ensemble, the Southwestern String Quartet and the University Singers.